Hinter „Liederhaufen“ verbirgt sich eine imposante, folkloristische Anthologie aus dem Chorschaffen des estnischen Komponisten Veljo Tormis (*1930). Hinter dem für Nicht-Esten mysteriösen Sammeltitel dieser CD „Laulu palju“ und dem missverständlich eingedeutschten „Liederhaufen“ verbirgt sich eine imposante, folkloristische Anthologie aus dem Chorschaffen des estnischen Komponisten Veljo Tormis (Jg.1930). Das Beiheft klärt nicht nur über die Bedeutung der hier ausgewählten (hervorragenden!) 41 Vertonungen und Bearbeitungen traditioneller Liedvorlagen – also über einen ganzen „Liederhaufen“ – auf, sondern fügt auch die kompletten Texte im original gesungenen Wortlaut und in ungekürzten deutschen und englischen Übersetzungen bei. Traditionsreiche Arbeitsgesänge, Tanz-, Liebes-, Spiel- und Kinderlieder, geselliges Liedgut (auch mit sozialkritischem Inhalt) sind mit einem Ausdrucksreichtum und stilistischem Feingefühl an raffiniert eingängigen Harmonisierungen und a cappella-Satztechniken „aktualisiert“ worden. Kaum kann man sich satt hören an den teils innig-gefühlvollen, teils temperamentvoll-übermütigen Darbietungen. Nicht zuletzt ist dies der phantastischen Klangkultur des mitreißend singenden und agierenden Philharmonischen Kammerchores Estlands unter seinem hochgeschätzten Leiter Tonu Kaljuste zu verdanken. 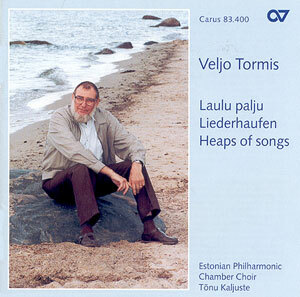 It is more than mere coincidence that Carus-Verlag of Stuttgart are also the publishers of the printed music for the choral works of the distinguished composer Veljo Tormis. Choral competitions both international and state-bound are still a vital activity around the world and the appetite for fresh repertoire remains largely unslaked. Tormis, quite apart from responding to his innate sympathy with a gift for choral writing, feeds this interest. His music can be fitted into the grand tradition of Scandinavian and Baltic choirs. That tradition is vigorous and poetic fed by composers such as Alfvén, Palmgren, Sibelius, Darzins and Ivanovs. Tonu Kaljuste's choir is fully into the idiom with acres of fierce muscular tone as well as otherworldly sweetness and hollow ochre-brown resonance. Listen for example to Kuhjaloola (The Haystack Builder in track 25) – typically one of a set of harvest work songs. Many of these have that character almost a capstan sea-chanty similar to the sound of the Gaelic waulking song. Before reading the helpful feature by Urve Lippus I had noted the similarity between these choral songs and the a cappella works of Kodaly. I am familiar with the Kodaly pieces from a series broadcast by BBC Radio 3 in 1981 and 1982. Kodaly even wrote one song based on a Finnish Kalevala episode involving Vainamoinen. Tormis was deeply impressed with the Kodaly pieces when attending the Hungarian festivities in 1962 to mark the 80th birthday. Tormis’s music is variously: roundedly melodic, warmly cocooned, violently tuneful, often using unison in thunderous affirmation, evocative of spirituals, primitive- ecstatic and lyrical. Apart from the Kodaly echoes we may occasionally think of Michael Nyman's wedding songs in Prospero's Books or of the ululating exultant confidence of Christopher Brown's Hodie salvator apparuit or Rosenberg's dizzying paeans of praise at the end of his Fourth Symphony. Howellsians would be likely to find reward in this singing. Highlights are numerous. One song suggests a familiarity with Rachmaninov's Chrysostum another picks up on the gentle rocking breath of En Saga. The Work Songs are bronzed and strong and the ecstatic calls of hoi tara voi tara are wonderfully memorable. In others (trs 9; 10; 12) refrains like ollale ollale, kosjad oleme and ellero ellero are catchy and likely to win immediate and long-term friends. Now I have heard this choir I urge them to tackle Arnold Bax's choral chef d'oeuvre, Mater Ora Filium, Poulenc's La Figure Humaine and Strauss's Eine Deutsche Motette. Here is a choir fully the equal of these testing works. They have a majestic mastery which includes the requisite power, range and flexibility. For now the choir can be heard in Carus's CDs of the Mozart Vesperae et Litaniae (83.401 and 83.402) as well as two Carus volumes of Vivaldi's sacred music (83.403 and 83.404). Although known the world over as a choral composer this pupil of Vissarion Shebalin has also tackled more complex works such as the Estonian Ballads for soloists, choir and orchestra (1980) and the oratorio The Rite of Birth for three choirs and orchestra (1999). Hearing these works has to be one of this listener's high priorities. I shall be disappointed if the next televised choral competition includes a choir that fails to present a work by Tormis.